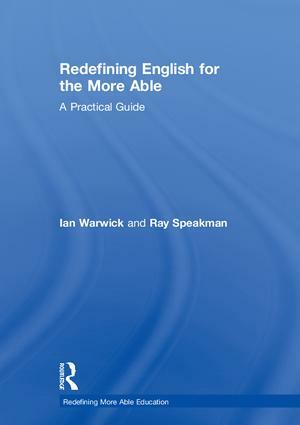 Redefining English for the More Able is a practical guide offering English teachers a range of strategies to stretch and challenge their students. Written by Ian Warwick, founder of London Gifted and Talented, and Ray Speakman, this book provides a fresh perspective on the purpose of English teaching and the benefits it can offer all students. Drawing on an array of ideas and examples from different genres of literature, the book discusses how ‘threshold concepts’ can be used to frame English teaching and push the boundaries of students’ learning. The chapters provide example lesson plans targeted at different age groups from Key Stages 2–5, and address different aspects of English, including short stories, poetry, film, drama and science fiction. Warwick and Speakman examine how the requirements for teaching more able students have received more recent focus under Ofsted, and offer specific examples of activities and reflective questions that can engage students more deeply in their appreciation of English. This well researched and accessible guide will be an invaluable tool for English teachers, teaching assistants and school leaders wishing to reflect on new ways of motivating and teaching the more able in order to develop the intellectual curiosity of all their students. 1. Analysing the Backstory: How did English Lose Its Way? 2. Redefining the Discipline: What’s the point of teaching English? 3. Overcoming the Hurdles: What barriers block the highest achievement? 4. Driving Engagement in English: Why are ‘manageable gaps’ so important? 5. Investigating the Theory: What can current research add to our teaching? Ian Warwick is the founder and senior director of London Gifted & Talented (www.londongt.org), which has worked with more than 3500 schools internationally. An inner-city teacher for 20 years, he has published extensively in the field of education and has written award-winning, high-challenge e-learning materials as well as several film screenplays. Ray Speakman founded the Birmingham Youth Theatre, has edited and written plays for schools, professional theatre and television, and was a teacher of English and a deputy headteacher in a large Warwickshire comprehensive.